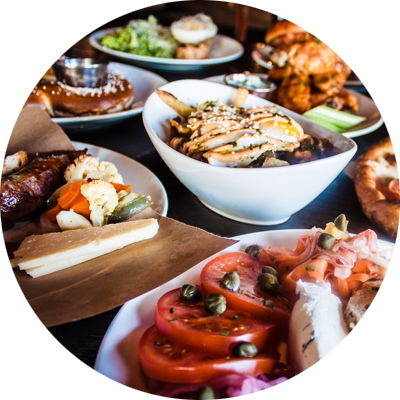 Ask anyone who’s been here and they’ll tell you straight out: we have some of the region’s best bar food. From the pizza crust to the pickles, our menu items are made entirely from scratch, from natural ingredients brought in fresh each day. Always fresh. Always natural. You haven't seen anything like this since your last trip to Milwaukee...and maybe not even then. 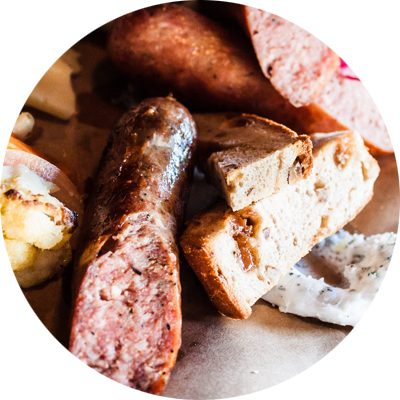 We offer a rotating roster of 40 different recipes — from time-honored classics to new takes on brats and Polish. Made with natural casings, of course. We know what you're thinking: every bar has a burger. Not THIS burger. The Haymarket burger is truly a showcase for meat. Ground fresh daily, we cook it up diner style with just a little salt and pepper, so the quality of our cuts shines through. We'll put it up against any burger in town. Our famous made-from-scratch pizza dough is a combination of red winter wheat, San Francisco Bay salt, love, and time. Long fermentation gives our crusts a depth of flavor reminiscent of a good West Coast sourdough. Our blazing hot deck oven turns them out crispy-delicious in Chicago. Visit our Michigan location for the smoky-hot wood oven version. Where do we begin? Choose from home-cured bacon, salads and soups, and other goods from our scratch kitchen. Try our veggie burger...it will amaze you.